I run the Shallow Sky mailing list, for discussing lunar and planetary observations (as opposed to Deep Sky observations). For more information, see the Shallow Sky page. Unfortunately the list is pretty much dead now (2009). Another project is The Hitchhiker's Guide to the Moon. A group of us on the TAC list were bemoaning the lack of good lunar observing books, and decided -- why not write one? There are several very accomplished lunar observers on the list, several of whom have been wonderfully helpful at sharing their knowledge with less experienced observers; the Hitchhiker's Guide is the result of this synergy. It's a work in progress, and can always use additional contributions. I also run the AstroSketch mailing list (a Yahoo group), since I like to sketch astronomical objects and wanted to talk to other people who enjoy sketching. There are some amazing artists on the list! I'm not, but you can see some of my astronomy sketches and especially moon sketches. 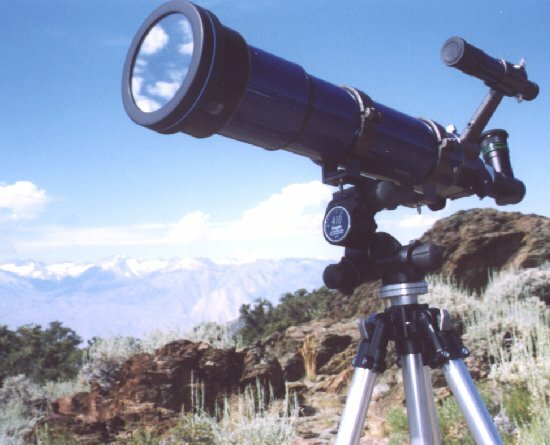 I originally got into astronomy as a teenager, in the MPAS at Garvey Ranch Observatory in the LA area (wow, it's so cool that there's a web page for it now). I got out of the hobby for a while, but got back into it last year here in the SF Bay Area. I joined the Peninsula Astronomical Society and started helping out on the Friday night public viewings at Foothill College observatory's 16" reflector and 6" refractor, though I no longer do that. Otherwise, I observe with friends in "The Astronomy Connection", a group of very active observers connected by an electronic mailing list, and also joined the San Jose Astronomical Association. A list of Challenging Summer Objects. A while ago I played (mostly taking moon pictures) with a QuickCam VC. See also posts tagged "astronomy" on my "Shallow Thoughts" blog. TAC Messier Marathon on March 8. December 9 was a good star party at Fremont Peak. Why do we observe, anyway? My baby! My favorite telescope is my totally homebuilt 8" dobsonian. It's a 4-tube collapsible design which nests into a very small space. A 13.1" truss-tube dobsonian with early 80's vintage Coulter optics, which just barely fits in my tiny sports car. I'm gratually modifying it to make it work better, weigh less and take up less space. A vintage '80 4.25" f/4 Coulter CT-100 collapsible rich-field telescope (a wonderful gem, wish they still made them). 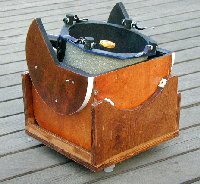 A 6" f/4 Newtonian which I built up out of an Earth & Sky mirror I bought at the SJAA swap meet for $30; total cost, about $120. 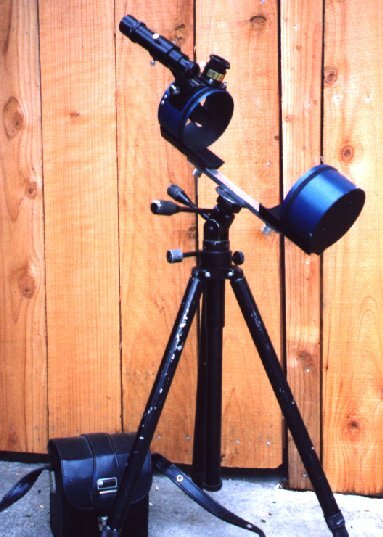 I like to take it to public star parties and set up next to $15,000 refractors so that when visitors become aghast at the cost of astronomy, I can counter with my cheapo 6" homebuilt. I originally mounted this on a SkyView and then on a Super Polaris, but I've finally made a Dobsonian mount for it. A Pro-Optic 90mm f/5.6 Maksutov which is a much better spotting scope and camera lens than an astronomical telescope. 80mm f/7 refractor, supposedly with Vixen optics (but there's no way to prove that) to use as a portable take-anywhere-and-use-on-a-tripod 'scope that's still good for planets. At right, Bill Arnett's picture of us as I put some finishing touches on my sketch of sunspots on 8/15/98 in the White Mountains. You can also see a lot just with cheap binoculars (though I also have a not-so-cheap 8x42 Ultraview bincoular which I like very much). I also dabble in astrophotography, where I'm more or less a beginner (though I did some plate-camera photography many years ago). Here are some shots of Comet Hale-Bopp like the one at the beginning of this page. 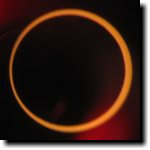 "Ring of Fire" Annular Eclipse, May 2012, from Red Bluff, CA and my my report on viewing the annular eclipse. Thursday, September 26, was a total eclipse of the moon. I viewed and photographed the eclipse from the Peninsula Astronomical Society's public eclipse party at Foothill College, in between showing people the moon and Saturn through my small telescope. My list of links to other astronomy sites was getting too long, so I've split it off onto a separate page.